The World Cup returned to Ulricehamn, Sweden for the second time today for the women’s 10-kilometer individual start freestyle event. Ulricehamn earned rave reviews when it first hosted a World Cup two years ago, with athletes expressing their gratitude for the top notch course preparation and for the support from a huge crowd of fans. This year appeared no different; tens of thousands of people lined every inch of the 5k loop, erupting in cheers for the racers as they passed, raising to a roar for those racing in their home country. As period 3 comes to a close and only two race weekends remain before the World Championships in Seefeld, Austria, athletes hope to be coming into their peak form, as their results may further implicate how they may stack up at the end of February. Firm tracks with no new snow made it easier for wax techs to create an even playing field for the racers than last week in Estonia, and a slight change to the 2017 Ulricehamn course included one additional hill to further test the athletes. Leading the way in bib number one, Sandra Ringwald of Germany set a fast tempo, posting splits that held her the lead until the fastest pack of women entered the course wearing bib numbers 30 and higher. As the later group began, Jessie Diggins looked strong as she knocked down the fastest times at each checkpoint. 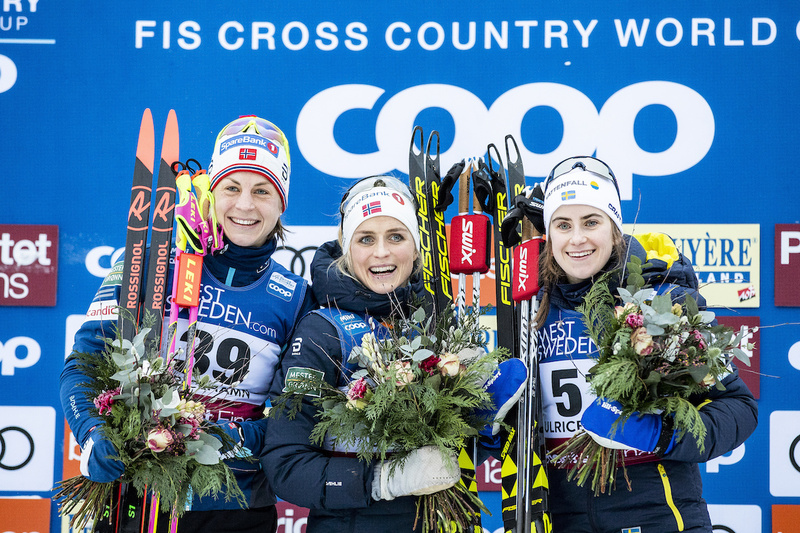 Diggins vied for the podium throughout the race along with Finland’s Krista Pärmäkoski, Sweden’s Ebba Andersson, and Norway’s Astrid Uhrenholdt Jacobsen and Therese Johaug. It was no surprise that Johaug took charge of the field upon starting, creating a gap over the next skiers that steadily widened throughout the race. Johaug crossed the line in a time of 22:48.2 minutes to remain undefeated in distance races this season. It is Johaug’s 50th World Cup victory. Her teammate, Jacobsen, moved into second place by the 5 k mark and held on to finish 22.8 seconds back on Johaug, sealing the deal on her first podium of the season. “Oh my god, it was crazy out there,” Norway’s Therese Johaug commented to the International Ski Federation (FIS). “I feel like it was the World Championships. I am so impressed with the people here in Sweden and Ulricehamn who took a trip up here and cheering for us. It was amazing. It was crazy. Racing in her home country for her first World Cup podium, Andersson skied conservatively through the first half with splits just faster than those of Diggins. The Swede then made a strong push in the final 5 k, closing on Jacobsen and pulling ahead of Diggins. As she crossed the line and clinched her spot in third, she was welcomed with a cacophony of cheers and a wave of blue flags from the sea of her countrymen in the stadium. A strong first lap put Diggins just ahead of Andersson, but her second lap did not quite hold off the Swede’s surge. Diggins crossed the line in fourth place (+38.3), followed by Pärmäkoski in fifth (+53.3). Also with solid results for the US, Sadie Bjornsen took 15th (+1:25.1), Caitlin Patterson (CGRP) 23rd (+1:49.9), Rosie Brennan (APU) 28th (+2:03.2), and Rosie Frankowski 42nd (+2:28.0). Dahria Beatty was the only Canadian entered. She finished 56th (+3:54.7). 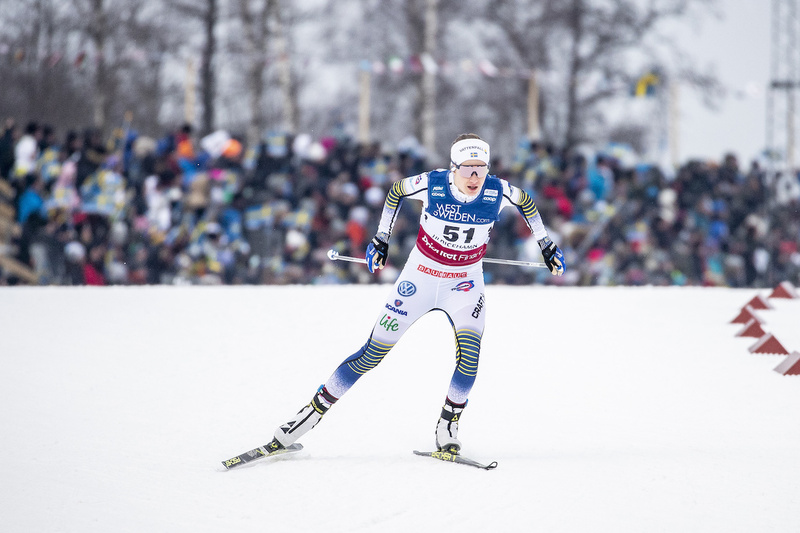 Moving ahead from a 13th place finish last weekend in Otepää, Diggins is feeling refreshed and positive. She attributes some of today’s strong performances to the adrenaline rush of watching the men’s and women’s U20 relays in Lahti this morning, where the men earned a historic gold medal and the women landed just off the podium in fourth. “First off, I have to say, I am so so proud of our junior team and so psyched for them,” Diggins told FasterSkier in a call. “We didn’t start out race until 2:15, so we were all gathered around watching the girls and watching the guys, and they are skiing so well. They are taking US junior skiing to a new level. It got me so fired up – I had happy tears when the boys won their relay, there’s nothing more motivating than that… So that brought a lot of really positive energy and momentum into the day for sure! “Nice racing by all the ladies,” Chris Grover told Fasterskier. “Really cool to see Rosie Frankowski just get off the plane a few days ago and she was challenging for the top 30 especially on her first lap… Sadie was in the top 10 for her first lap but faded a little bit at the end, but she’s been in a pretty good training phase this week preparing for the World Champs. She felt good about her race that she was skiing as fast as she was given the amount of training she’s been doing. Frankowski was offered a start after her second place finish in the 20 k skate at US Nationals. She will also be starting in the 10 k classic in Cogne, Italy. The winner of the 20 k at US Nationals, Patterson earned her best World Cup result today. “Racing today felt good,” wrote Patterson in an email. “It’s great to feel forward progress. Last week I may have been holding onto a little more travel and jet-lag fatigue than I realized. I felt fine but was not able to dig really deep during the race, so it was nothing special. This week I do feel better, but mostly I was excited to skate, to enjoy racing this course, and to feed off the energy of the crowds. “I know I can keep improving, because today was quite good but it wasn’t perfect, there’s more to come! After this weekend I’m heading to a training camp in Davos Switzerland and looking forward to continuing to sharpen the fitness towards the later season. Both Patterson and Brennan earned FIS points for their top 30 finishes. “I had to conquer some of my weaknesses out there today which was a good challenge,” wrote Brennan in an email. “I didn’t quite do as well in the challenge as I had hoped, but there were some positives to take away. I found some better speed on the second lap which I was happy about and moved up in the end. All of the Americans expressed their appreciation and gratitude for the race atmosphere in Ulricehamn, where FIS reported an estimate of 27,000 spectators. “Right now, all my clothes, my hair, everything smells like a bonfire,” Diggins laughed. “It was so cool. I’ve talked about this before because I get annoyed that women and men don’t switch days on the Holmenkol, so if you’re not a man, you never get to race with that amount of people, just because Saturday is the big day… everyone always buys tickets for Saturday, that’s the big party watching day. Racing continues tomorrow with the 4 x 5 k relay.